I purchase an Ipad from Wal-Mart on Black Friday. I don’t know how I’ve survived all this time without it. I shouldn’t say I got it on “Black Friday” when I actually purchased it on Thanksgiving Thursday. Anyway…that’s beside the point. I believe that IPAD must be an abbreviation. Without a doubt, the letters stand for Intensive Productivity Annihilation Device. When my Ipad is in my hands, all I want to do is explore, read, learn, and try new apps. The apps make exploration so easy and convenient. I decided to spend the money on an Ipad because I learned that with the Kindle app, I can get my Kindle books. My eyesight is not what it used to be, and I liked the idea of reading on the big Ipad screen. That decision was well founded because reading on the bigger screen is so much easier. 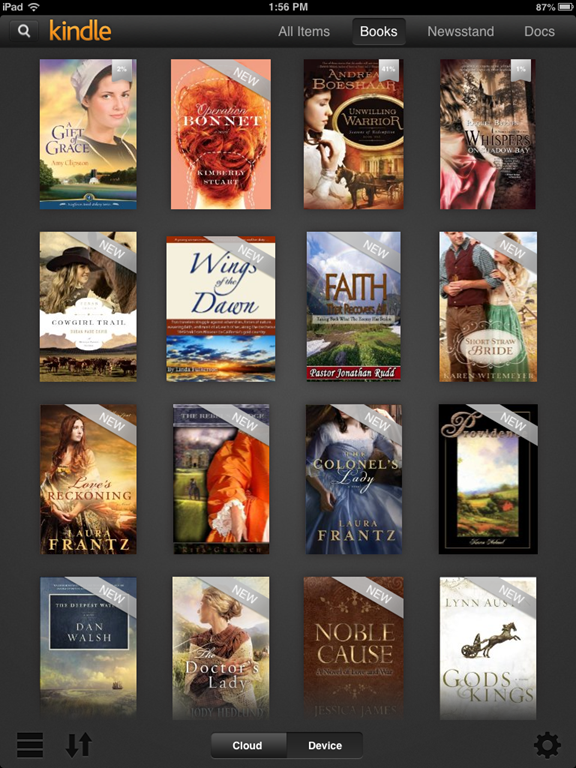 I downloaded the Kindle app and VOILA…all my books are there. I love the digital age. My ipad weighs as much as one book and it contains over 200 books. Above, you see a couple screenshots of my Kindle books. I can just see my sister laughing when she see’s some of my book choices. My sister and I have very different taste in books, to say the least. 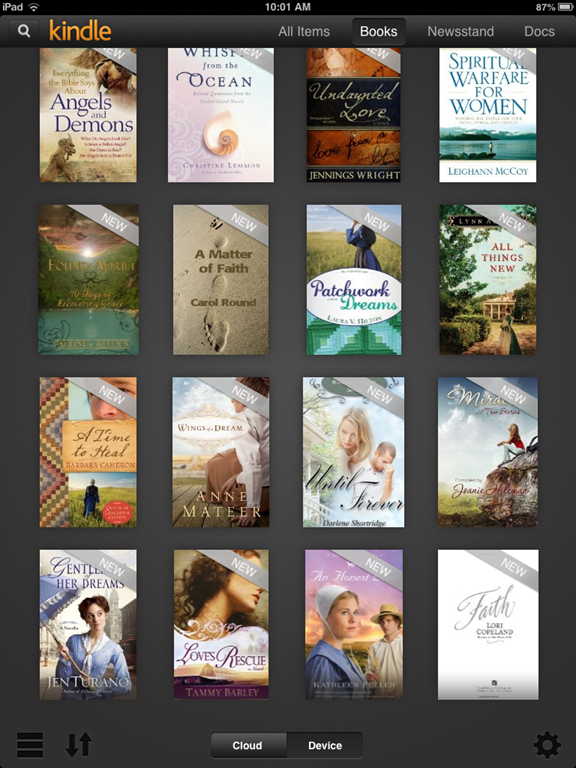 Can you see by looking at the book covers that I like Christian historical fiction? I think the Kindle app from Amazon is my favorite app. 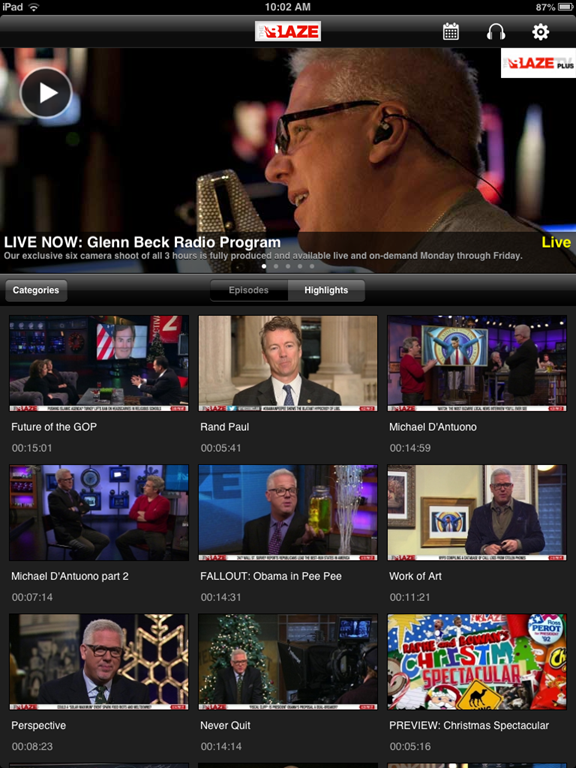 On my way home from purchasing my Ipad, I remembered that Glenn Beck’s app for “The Blaze” is only available on Apple devices. I made a mental note to download that app ASAP. I have missed Glenn so much since he left FOX. I’m not even subscribing to his daily broadcast yet. I’m just viewing the free show highlights on the app and I couldn’t be happier. The Blaze app is a major productivity annihilator. In only a few days, Glenn has reignited a fire in me. Glenn Beck knows how to speak to my heart. If I used my new Ipad for nothing else other than Glenn viewing, that would be fine with me. This is an interactive globe app. I love this. 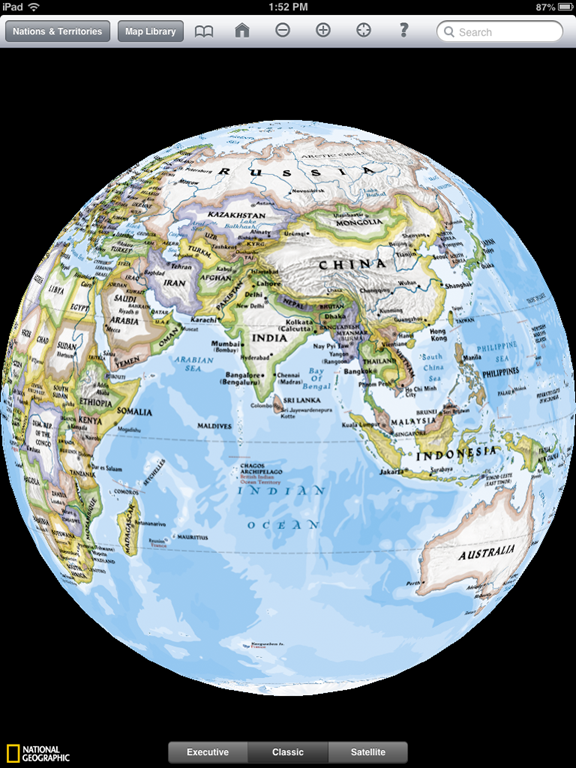 You can rotate the globe and expand the maps with pinch and zoom. I pinched and zoomed all the way to a satellite view of my house. 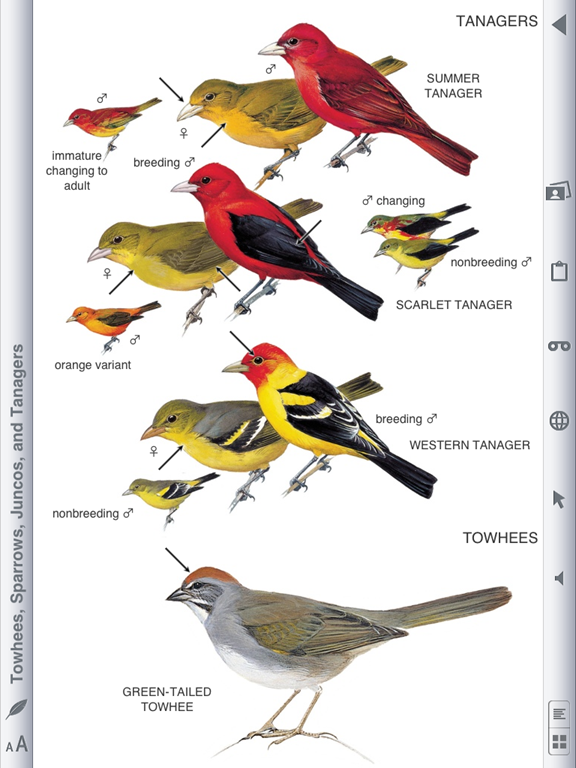 This is a screenshot of a free app showing species of North American birds. I love the free YouVersion Bible app. These are just a few of my downloaded apps. I’m sure there are many more to discover. No wonder Apple is a global phenomenon. 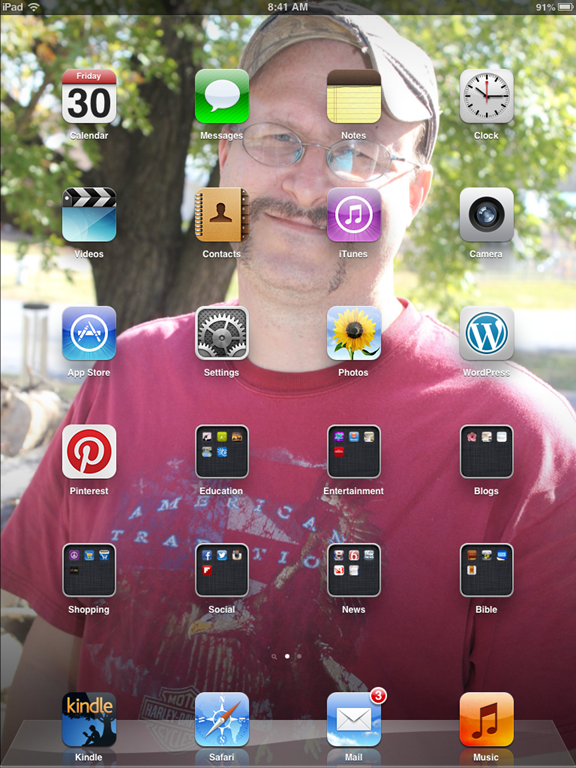 Love…love….love my Ipad. Love the apps. I just need a 4 hour window of time each day for productivity annihilation. Does anyone have any suggestions for free apps? I like any type of free book or education apps. This entry was posted in My Stuff and tagged fun, life, reading, sisters. Bookmark the permalink. It’s annoying me that I can’t comment on your blog from work….must be a firewall thing. There’s some great apps here for me to try! The globe one looks really interesting. I have discovered that as long as I have a laptop, my phone, and my dslr……..I am good. I like my kindle, and the ipad looks cool, but I’m totally happy with the basics. And….I wouldn’t really say we have very different taste in books. I can easily read the same kind of books you like, and enjoy them, but I need more than just that style. If I read only one genre for an extended period of time, I would go completely mad with boredom. I must have diversty. I have a new Ipad, but when Clay and I were in Best Buy the other day, I saw the new 10 inch HD Kindle Fire, and I got that “feeling”. You know what feeling I’m talking about? They feeling when you want something really bad that you KNOW you don’t need. I bout went crazy when I saw the new Canon professional grade cameras. 🙂 Best Buy is not a good place for me to go. I love historical fiction first and foremost, but I do like branching out into other genres more than I used to. I have you to thank for that.